The Pioneers-Craters region has a rich human history and culture. Originally inhabited by the Shoshone and Bannock people, the region is traversed by Goodale’s Cutoff, a spur of the Oregon Trail, now being evaluated for designation as a National Historic Trail. Goodale’s Cutoff was used as an alternative to the main Oregon Trail in order to avoid conflict with the Shoshone-Bannock people. Tens of thousands of people used Goodale’s Cutoff with the highest use occurring in the mid to late 1860s. The region was settled by waves of pioneers, miners, sheep ranchers, and farmers beginning in the 1870s. 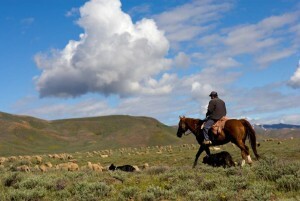 After the mining booms and busts of the late 1800s, sheep ranching gained prominence. At one point, the City of Ketchum was the second busiest sheep-shipping port (via train) in the world, after Sidney, Australia. In 1936, Sun Valley Ski Resort (located at the northwestern edge of the landscape) began attracting visitors from around the world and set the stage for the area’s growth. The Sun Valley Resort became a catalyst for resort activities in the Wood River Valley, while to the south around Carey a more agricultural economy with a mix of crops and livestock continued to predominate. In 2001 Craters of the Moon was expanded to National Monument status in recognition of unique landscape values and created a new gateway opportunity for communities like Carey on the southern flank of the Pioneer Mountains. Over the last several decades the area was among the fastest growing in the state, successfully capitalizing on the value of natural amenities to draw people and business to the area. The benefits of this expansion largely benefited Wood River communities but were also evident down valley and in smaller communities like Carey. Today, the region supports a mix of human uses including a recreation and lifestyle-based economy, productive alfalfa and malt barley farms, extensive cattle ranches and one of the most intact long-distance migratory sheep ranching cultures in the West. Popular recreational pursuits in the region include downhill, cross-country and backcountry skiing, mountain biking, hiking, horseback riding, motorcycle riding, and hunting and fishing. Long-time residents and visitors alike marvel at the primitive, unspoiled and uncrowded nature of recreation in the region. Overall the economy of the Pioneer Mountain-Craters of the Moon region is a mix of traditional farming and ranching enterprises alongside a resort economy that supports a range of recreation and broader services activities. Like many rural places in the West, the region was hard hit in the latest recession. The resort, real estate, construction, and related finance sectors saw significant declines and commodity prices dipped creating challenges for agricultural producers as well. Unemployment in Blaine County rose from a low of 2.3% in 2007 to 8.9% in 2010. The economy of the area, which centers in the Wood River Valley, has largely been recovered which has been aided by high agricultural commodity prices. Looking ahead, area leaders are seeking innovative ways to build greater resiliency and expanded opportunity in this special place.